The Dior Technologic sunglasses collection from summer 2015 fashion show are characterized by their elegant and contemporary shape. This new Dior model is another example of an exotic design and perhaps one of the most daring of all. These models are made of high-quality materials as its exclusive and futuristic style shown. Dior Technologic models (RHL86, 84JOT, RHL83, 84J84 and 65Z2K) represent the distinctive elegance of Dior brand and they are perfect for women (and bold men, why not?) who are looking for a modern and high-quality accessory that complement their looks. 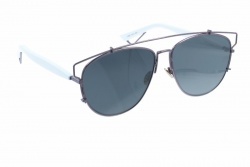 Dior Technologic sunglasses are unisex and they have aviator shape. These models also have a very thin metal frame which connect both lenses’ extremes. Timeless and technologic touches that create a unique and irresistible combination. As we saw in Dior So Real collection, Dior Technologic mirror lenses are the central element in this collection but in this case, the lenses are quite flat. The mirror and single-colour lenses are manufactured in wide range of colours that leaves nobody indifferent –gold, silver, black and so on–. Finally, the matte black temple tips add a final touch to this impeccable design. And of course, because it couldn’t be other way, Dior Technologic lenses also provide 100% protection against UV radiation. Moreover, anti-reflective coatings can be added to these models.